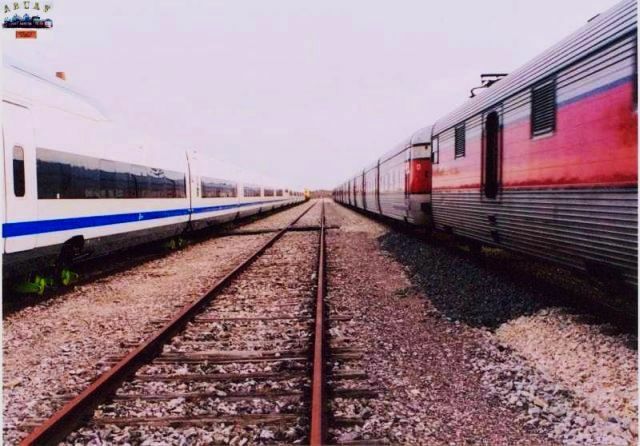 Tren de Alta Velocidad serie 102. 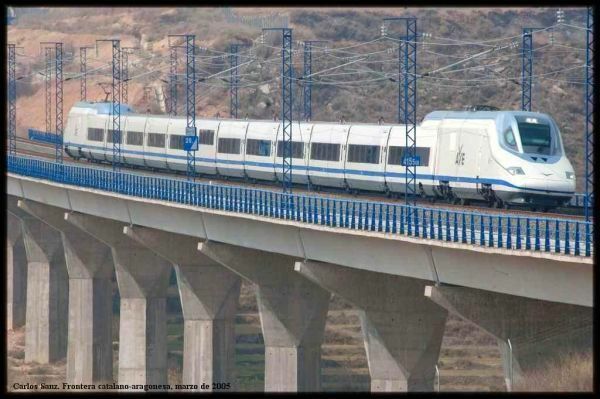 Construido por Talgo. AVE train series 102. 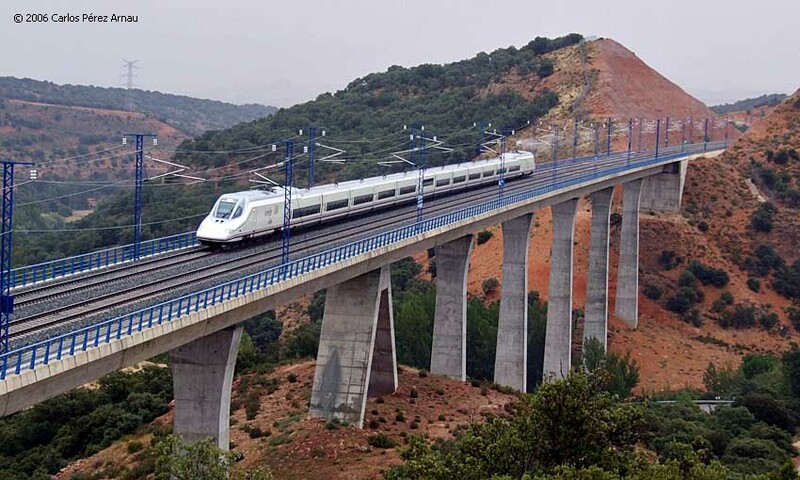 Constructed by Talgo. Ave 102 en Vinaixa. 28/12/2010. AVE 102 004 set of RENFE-AVE, hauled with a rebuilt Class 333 (333 315) of RENFE-Cargas, seen on the way from the Talgo Factory in Ribavellosa (close to Miranda de Ebro) to the Talgo Workshops in Las Matas (Madrid). 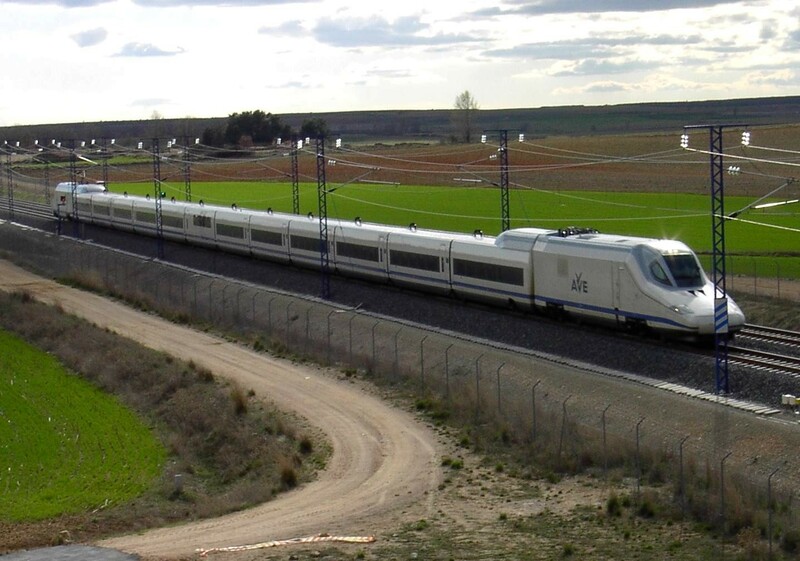 This train is seen on the Burgos-Madrid "Directo" line. While this line was originally to be part of a standard-gauge link between France and Morrocco, furthermore tailored for high speeds, the transfer of AVE-102s ironically and radically takes the other way round: Vevey diplories required, while speed restricted to 50kph, given that the whole train is only braked by the loco and freight wagons. Pic taken between Cogollos and Villamayor de los Montes. 04th March 2003. 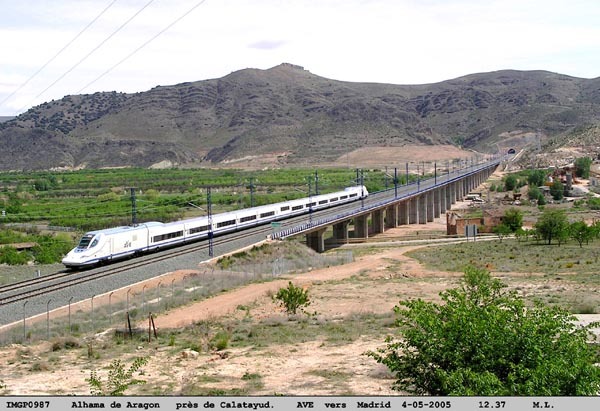 AVE 102 004 set, seen on the way from the Talgo Factory in Ribavellosa (close to Miranda de Ebro) to the Talgo Workshops in Las Matas (Madrid). 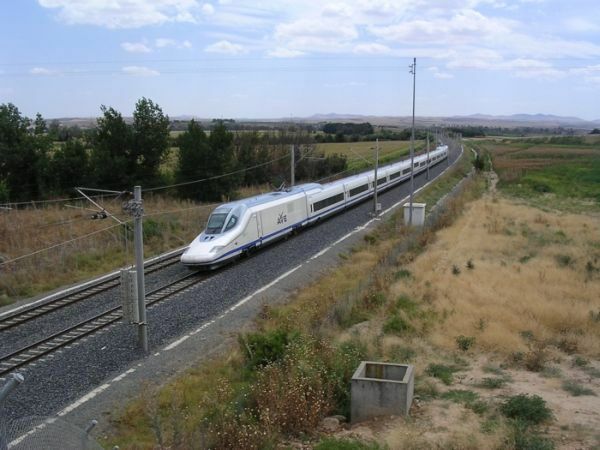 This train is seen ate the very beginning of the Burgos-Madrid "Directo" line, about 1km West of Burgos Station. 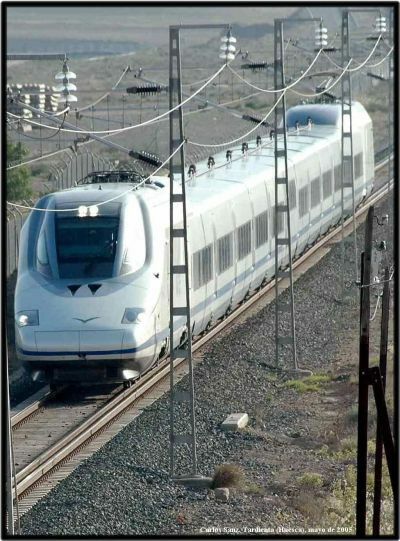 While this line was originally to be part of a standard-gauge link between France and Morrocco, furthermore tailored for high speeds, the transfer of AVE-102s ironically and radically takes the other way round: Vevey diplories required, while speed restricted to 50kph, given that the whole train is only braked by the loco and freight wagons. 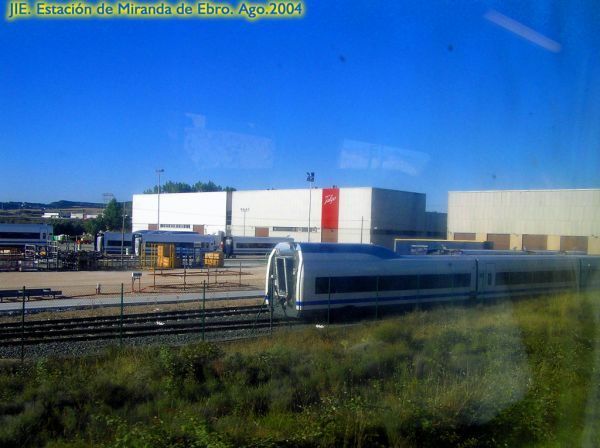 On the left, AVE 102 004 set, on the way from the Talgo Factory in Ribavellosa (close to Miranda de Ebro) to the Talgo Workshops in Las Matas (Madrid), is stored on a siding in Fontioso, on the Burgos-Madrid "Directo" Line. 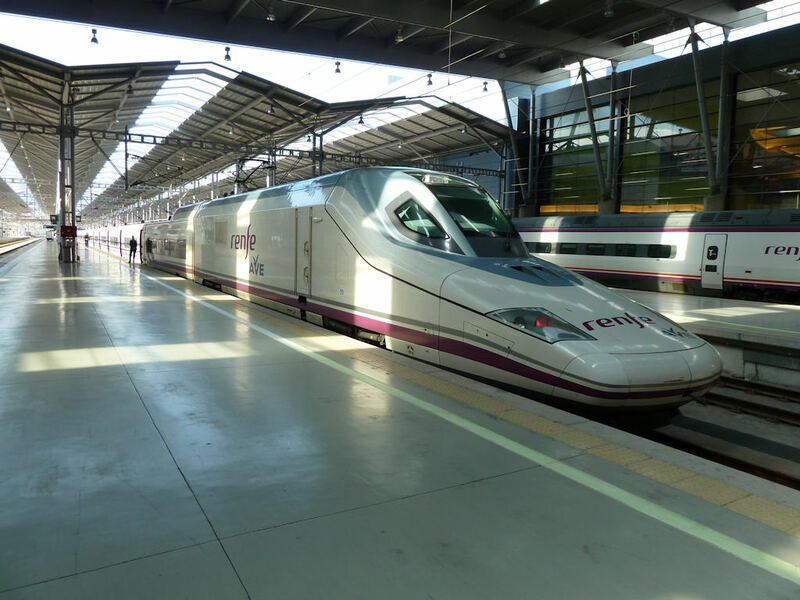 On the right, Talgo 201 Madrid-Hendaye/Bilbao, hauled with a Class 333 Diesel loco, passing the station at full speed. 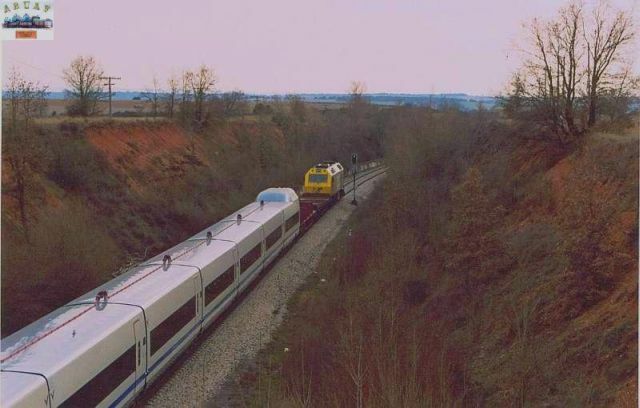 Turista-class car of AVE 102 002 (Car AVE-102 608), seen at Madrigalejo del Monte, on the Burgos-Madrid "Directo", on the way from the Talgo Factory in Ribavellosa (close to Miranda de Ebro) to the Talgo Workshops in Las Matas (Madrid). Madrigalejo del Monte. 04th November 2003. Photo by Carlos Sanz (csanz@menta.net) (Acknowledgements). 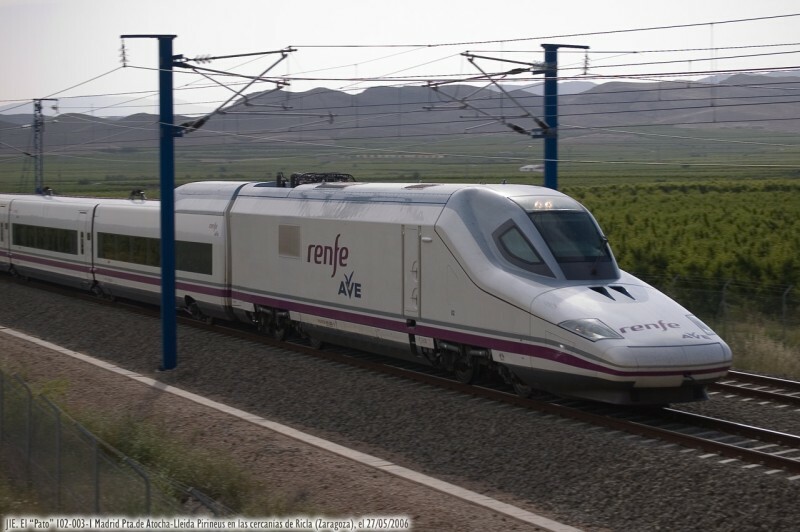 AVE-102 set of RENFE-AVE, seen on trials on the Madrid-Sevilla HSL. 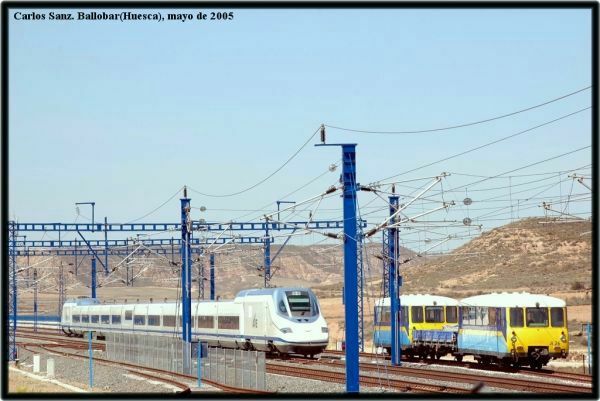 Photo by Ramón Gomez Fernández-Tejeda (mon80@tranvia.org)(Acknowledgements). 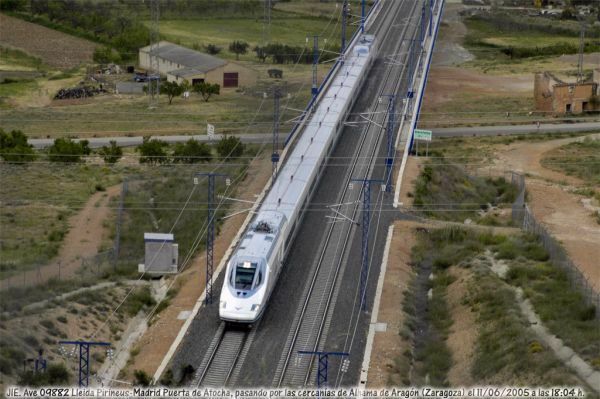 AVE-102 set of RENFE-AVE, seen running up the Terrer Viaduct, bound for Madrid. At this stage and thanks to this 22% (1 in 45) gradient, the HSL leaves the Jalon Valley (through which it runs for a while to so as to serve Calatayud), and eventually heads towards the Sierra de Solorio. 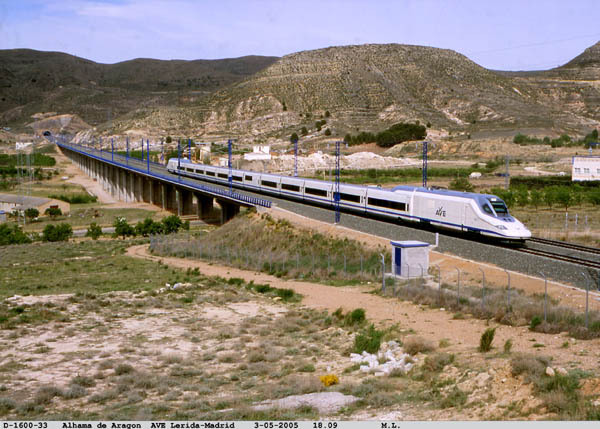 AVE-102 set of RENFE-AVE, seen passing the Ballobar Loops. This place is part of the Monegros, a very dry plateau which stands between the valleys of Rios Cinca and Ebro. 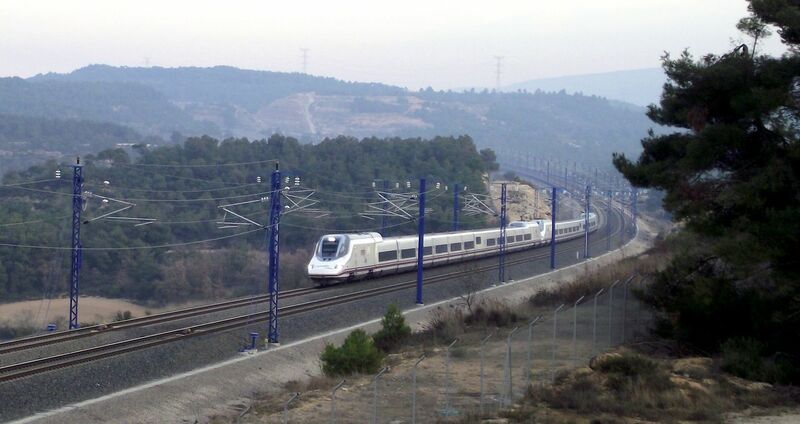 One can also spot 2 A-20 DMUs of ADIF (ex-GIF and ex-771 of DB) on a siding. 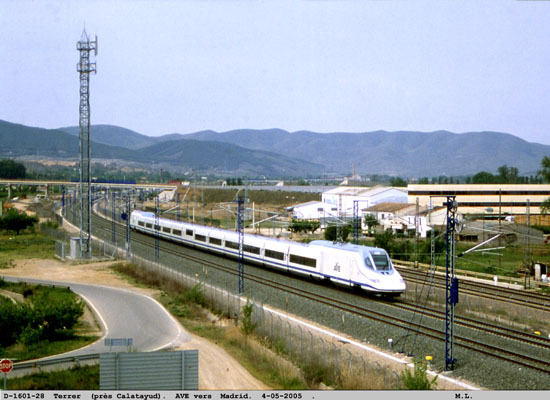 Talgo factory in Ribavellosa, seen from the Bilbao-Miranda de Ebro line. One can notice many AVE-102 trailers. Photo by Jose Ignacio Esnarriaga (jiesnarria@telefonica.net) (Acknowledgements), from Tranvia.org. 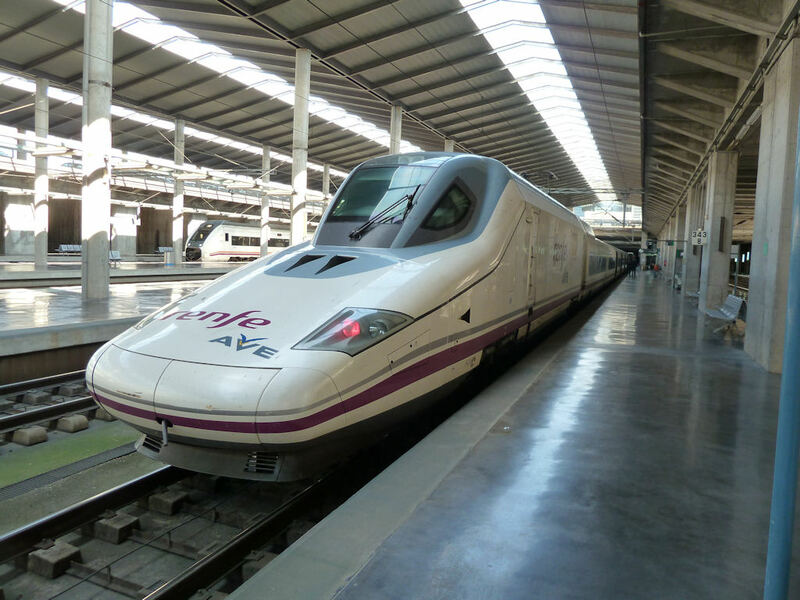 Class 102 AVE set (102.003, Talgo 350) of RENFE-AV LD (Alta Velocidad-Larga Distancia, ex-AVE), seen with the new corporate identity of RENFE-Operadora, on a Madrid Atocha ---> Lleida Pirineús AVE Larga Distancia service. Photo by José Ignacio Esnarriaga (Acknowledgements). 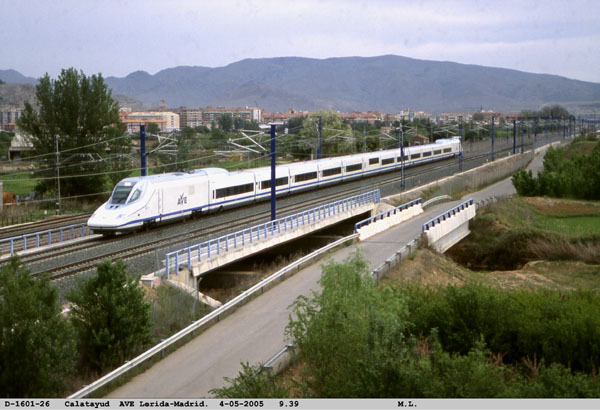 AVE-102 set of RENFE-AVE, seen nearing Tardienta, coming from Huesca and bound for Zaragoza. 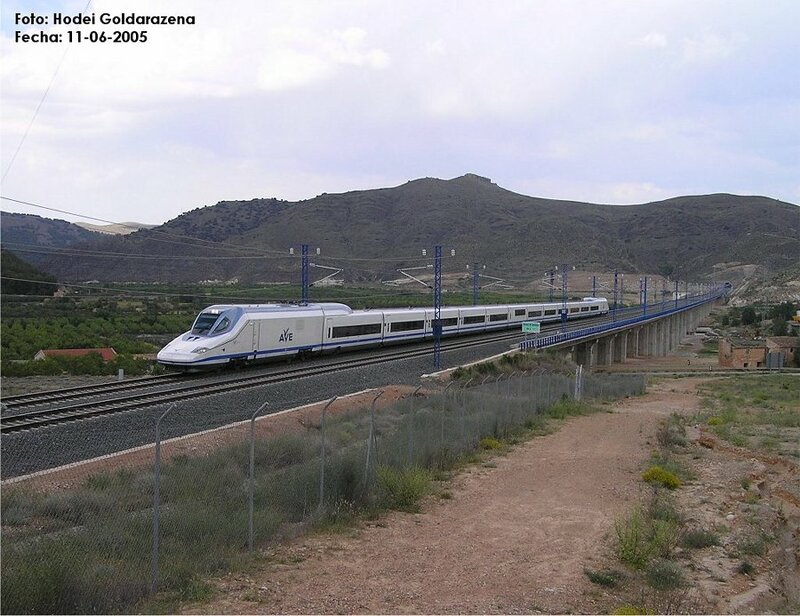 At this stage, this set was still running on the (dual-gauge) Huesca-Tardienta branch. 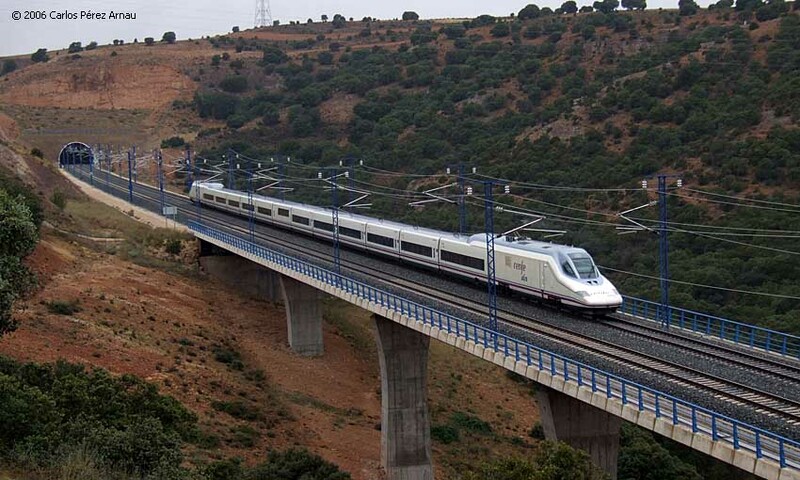 AVE-102 set of RENFE-AVE, seen running towards Lleida-Lerida, on the Viaduct of the Clamor Amarga, still in Aragon, yet very close to the border with Catalonia. 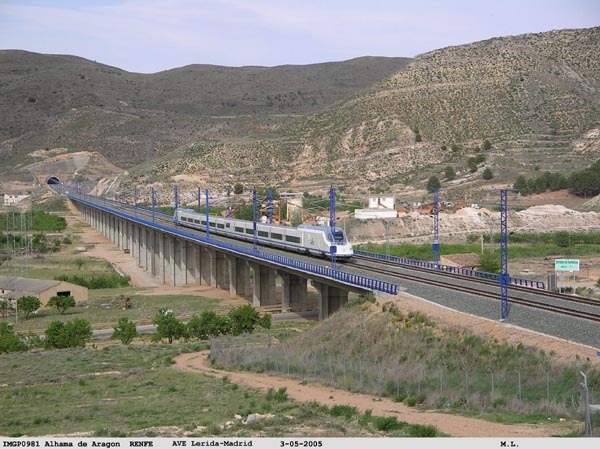 AVE-102 set of RENFE-AVE, seen running towards Zaragoza and Madrid, on the Viaduct of the Clamor Amarga, still in Aragon, yet very close to the border with Catalonia. Photo by Bernat Borràs (trenscat@menta.net) (Acknowledgements). 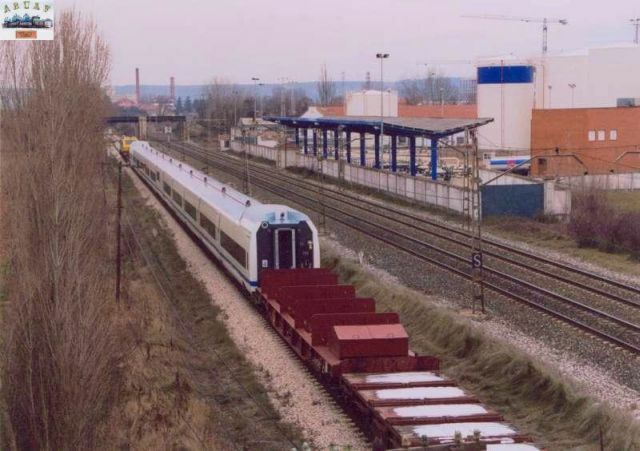 Coches de la serie 102 en la factoria de Talgo. 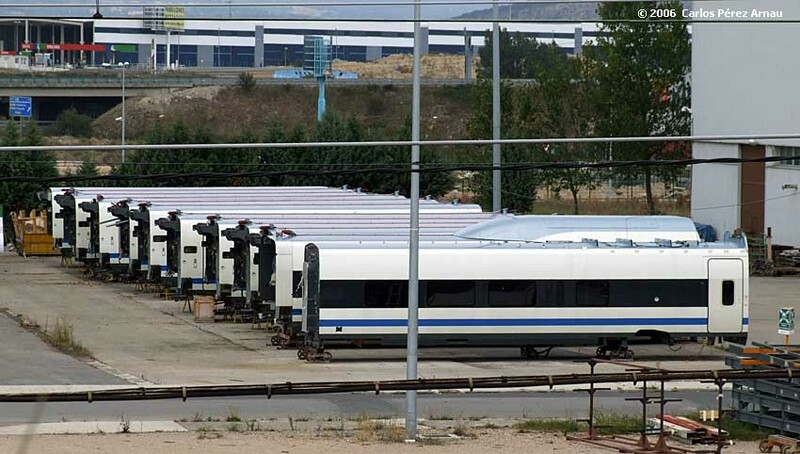 Cars of the series 102 in Talgo's factory. 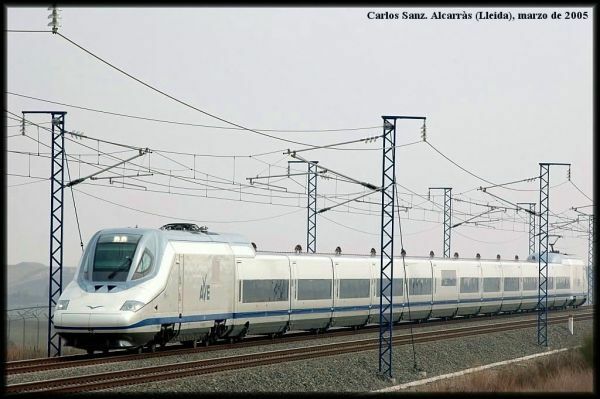 Ave serie 102 Madrid-Barcelona su paso por Alhama de Aragón. 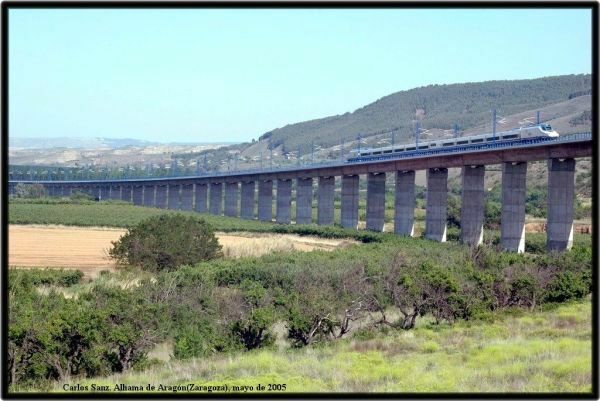 Un AVE Lerida-Madrid franchit le viaduc de Alhama de Aragon non loin de Calatayud. 3-05-2005. Espagne. RENFE. 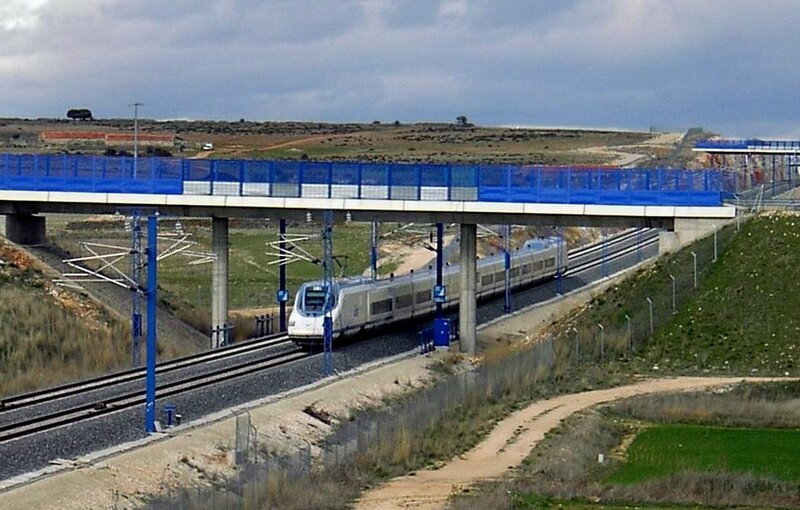 AVE Lerida-Madrid traverse le site de Alhama de Aragon et son viaduc. 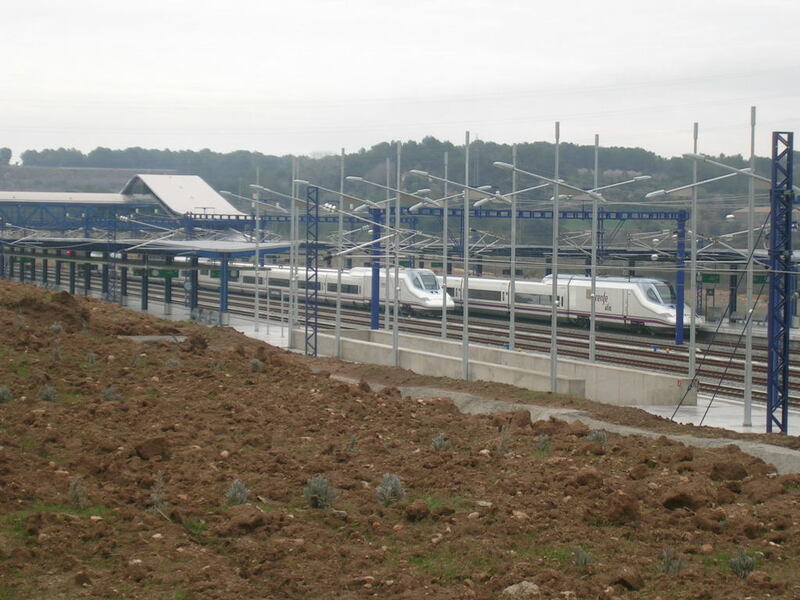 (non loin de Calatayud).4-05-2005. 12.37. AVE-102 (102.012) set of RENFE-AVE, seen on AVE 9882 (Lleida Pirineus-->Madrid Puerta de Atocha), leaving the Viaduct of Fuente Delices, about to enter the Tunnel of Alhama de Aragon. 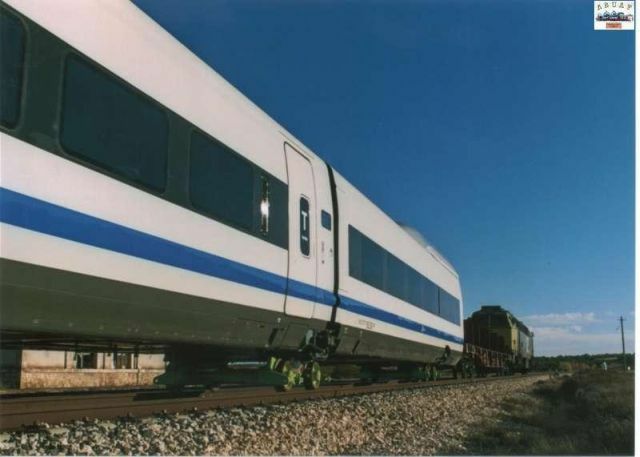 Class 102 "El Pato" (The Duck) is used for high-speed services over standard gauge lines. 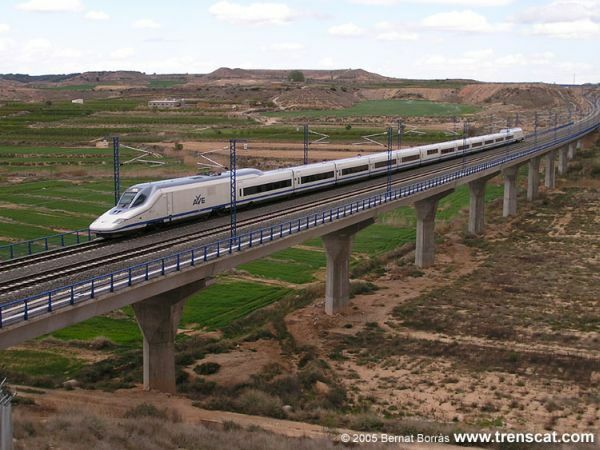 Trainset 102009 has just arrived at Cordoba with a service from Malaga to Madrid. 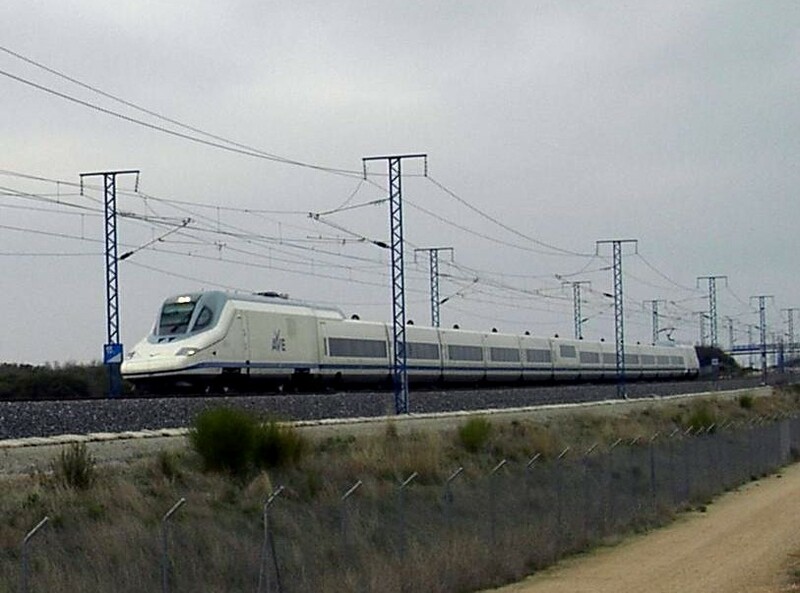 Class 102 "El Pato" (The Duck) is used for high-speed services over standard gauge lines. Trainset 102009 is ready to depart from Malaga towards Madrid.